Walkability shouldn’t be a value limited to where we live. More and more Oregonians want to work in places within easy walking distance of amenities and services they need to access throughout the day. Smart employers are recognizing this trend, and meeting it. It’s not something limited to the commercial districts of large cities, either. Almost every Oregon community has great potential to attract and sustain the growing number of employees interested in walkable workplaces. Now Medford is experiencing a bigger payoff: one business downtown usually attracts more. Lithia’s move has led other businesses to take another look at downtown Medford. Last week, Pacific Retirement Services, which runs a network of retirement homes and care facilities across the West, announced that it is passing up a site it owns near Interstate 5, and is instead pursuing a new headquarters in downtown Medford. The Mail-Tribune reports that the company is working with two other local corporations to plan a new 120,000 square-foot headquarters on Main Street, a few blocks from Lithia’s new headquarters at The Commons. While the plans are still in process, PRS has indicated they’d like a building with an innovative design and may one day consider adding housing to the building. And the payoff continues. The Commons also includes 20,000 square feet of new retail and restaurant space, and two new park blocks, and more employees in downtown Medford will likely mean more potential for other businesses to open. As the Mail-Tribune wrote in a recent editorial, these projects “could provide the critical mass to increase demand for the restaurants and clothing and other specialty retailers already situated in the central business district, plus encourage new investment to cater to the new foot traffic.” One thing that editorial didn't mention: it's also a better property tax generator for the city, per acre. All across Oregon, employers are increasingly interested in walkable workplaces. A recent OPB report describes how the Portland region is experiencing a reversal of the decades-long trend of houses and corporate campuses moving to drivable suburban areas, with little concern for their walkability or proximity to amenities and services. Many regional residents, especially younger residents, are moving to walkable neighborhoods in Portland and smaller communities like Hillsboro, Milwaukie, and West Linn, even though their employers may still be further away. Worried that they will not be able to attract or retain such talented workers if they have to drive to work, smart employers are looking to meet them closer to where they live, or in places they can access more easily. For example, for its Health Professions Campus (pictured left), which opened in 2005, Pacific University didn't locate near its original campus in Forest Grove, where many of its employees and students would have to drive. Instead, it built in downtown Hillsboro, near a MAX stop and within a short walk of a variety of shops and restaurants. And a Willamette Week cover story last year featuring the “tech wizards of the Silicon Forest” was notable not only for the great ideas of start-ups like Urban Airship, Puppet Labs, and Thetus, but for where these firms are locating: in the city’s most walkable, transit-connected neighborhoods. They’re joining a growing number of firms specializing in apparel and graphic design, advertising and publishing, and light manufacturing who have made similar choices. The importance of walkability to businesses was further highlighted recently when OfficeSpace.com, a Seattle-based company that provides commercial office space listings to connect employers with brokers, just began adding Walk Score and Transit Score ratings to its listings. “Employers really want to know if there are amenities nearby for their employees. It’s the same for transit scores,” says CEO Susie Algard. Amenities that matter include nearby restaurants, doctors’ offices, fitness facilities and parks, as well as available parking, although many employers also seek transit-friendly places to reduce the need for so much parking. Next up for many employers: looking for locations where their employees can walk to work. 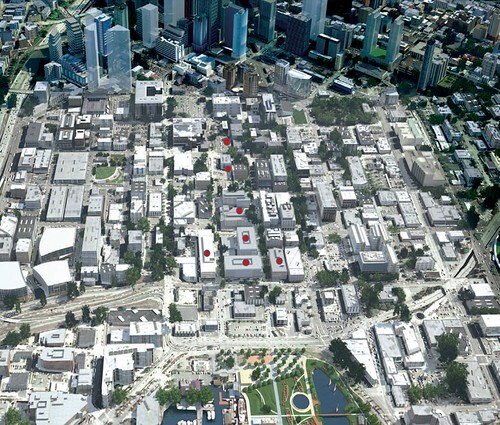 For example, Algard points to Amazon’s recent decision to build a new multi-building headquarters in Seattle’s eminently walkable South Lake Union district (proposal at right; red dots indicate proposed buildings). The growing number of high-quality apartments and other housing developments in the area were a major consideration for Amazon. “A lot of people would love to walk to work or take the bus, and never have to get in a car,” Algard says. This is especially true for the most talented employees in Northwest cities today. So, how do communities attract these companies and employers, and begin the positive cycle of attracting more activity and more business to their walkable downtowns and districts? Clearly, it takes targeted investments that encourage walking, local business development, and taking the bus or train to work. These investments cost a lot less in the long run than extending utilities, roads, and broadband to far-flung corporate parks. And they also bring much more property tax to the community revenue, per acre. Through wise land use and transportation policies, and targeted incentives, communities can make it clear to employers that existing, walkable neighborhoods are the priority for future employment growth. In the long run, more walkability at work means better access for employees to the things that they need to do, more investment in existing neighborhoods, decreased pressure to develop farmland and open spaces, less congestion all around the region, and more time for workers to spend with their families or having fun. That’s a vision anyone can get behind. Pacific University Health Professions Campus, Hillsboro: M.O. Stevens, via Wikimedia. Amazon's new campus: Vulcan Real Estate, via Atlantic Cities. This piece is part of 1000 Friends' Oregon Stories e-newsletter for April 2012. Return to the full issue. Would you like to recommend a "Walkable Workplace"--a company that embodies the Oregon spirit of livable communities, connected urban and rural regions, and/or sustainability? Recommend one here! Receive these stories first by signing up to receive our monthly Oregon Stories e-newsletter.